With fresh herbs and that perfect smokey flavour, this take on a classic from Vancouver food bloggers Adrian Harris and Jeremy Inglett makes the case for grilling until the snow comes. Typically, when #sweaterweather officially hits and the leaves begin to fall, we jump at the chance to trade in BBQ’d bites for cozier fare. But this year, a recipe from the new cookbook Cooking in Color by Vancouver food bloggers Adrian Harris and Jeremy Inglett is convincing us to do just the opposite. 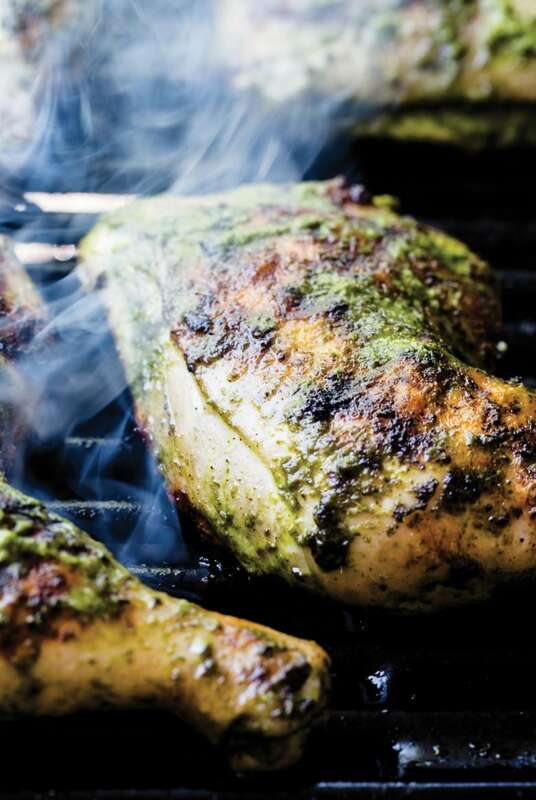 Covered in fresh herbs, and packing the perfect amount of heat, this chimichurri chicken dish is tempting enough to make us declare that BBQing into fall is the new wearing white after Labour Day. As you might have guessed already, we like our greens, especially herbs. Here we thought we’d showcase one of our most frequently used: cilantro. If you’re not a fan, just give this a try and tell us you don’t love it. Its strong flavor is balanced perfectly by the addition of basil, parsley and a nice kick of jalapeño. In a blender, combine cilantro, basil, parsley, jalapeño, minced garlic, olive oil and red wine vinegar. Blend until smooth. Transfer half of the chimichurri to a resealable bag; reserve the other half in an airtight container and refrigerate until needed. Add chicken to bag with chimichurri, seal and turn to coat. Refrigerate for at least 8 hours (and up to 24 hours). Heat barbecue or grill pan to medium-high. Cook marinated chicken, basting with the reserved chimichurri and turning occasionally, for 15 to 20 minutes, until it reaches an internal temperature of 165°F when tested with a meat thermometer. Serve immediately. Tip: The longer you let the chicken marinate, the more rewarding the outcome. Recipes from Cooking in Color: Vibrant, Delicious, Beautiful Food by Adrian Harris and Jeremy Inglett ©2018. Published by HarperCollins Publishers. All rights reserved. Crispy cauliflower steaks, chili-roasted chickpeas, creamy goat cheese mash… Meat who?